You’ve identified an organism in your environment. Now what? If you work in a non-sterile pharmaceutical manufacturing laboratory, chances are you’ve encountered this question. You know environmental monitoring doesn’t stop at detection, but what are the correct next steps to keep your products safe and laboratory in compliance? Instances of U.S. Food and Drug Administration (FDA) warning letters and observations associated with inadequate environmental isolate testing are on the rise. As a result, laboratories are seeking guidance to determine what to do with their environmental isolates. These laboratories may consider including the isolates in disinfectant efficacy, growth promotion or antimicrobial effectiveness challenge tests. 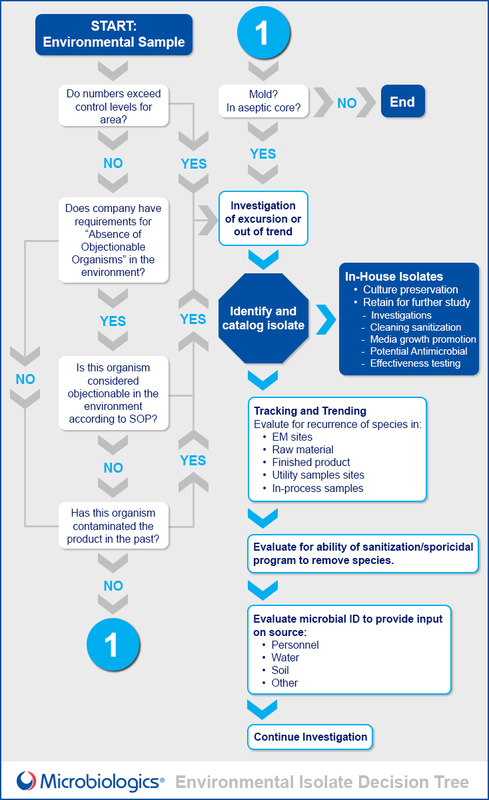 The guide below, created in partnership with Scott Sutton, Ph.D., will help you determine the best plan of action the next time your lab discovers an environmental isolate. Microbiologics would like to thank the late Scott Sutton, Ph.D., for his contribution to this post. very usful for non sterile products.